The tea cosy body is fully lined; the outside is knitted using 8 ply wool and 4 mm needles, in moss rib stitch. The lining is knitted using the same yarn and needles, and knitted in 2x2 rib. The lower edge is crocheted with a 4mm hook in shell stitch. The flowers and leaves are crocheted with a 3.5 mm hook, using shades of pink and green 8 ply. Pink moss stitch rib tea cosy outer body. Make 2 pieces. Cast on 44 stitches, using 8 ply yarn and 4 mm needles. First row, (K3, P1); repeat to the end of the row. Second row, (K2, P1, K1); repeat to the end of the row. Repeat these two rows until the work measures 13 cm. Decrease; beginning on a first row. (K1, P2); repeat to the end of the row. (K1, P2 tog); repeat to the end of the row. (22 stitches). Work 3 rows of (K1, P1); repeat to the end of the rows. Sew together the two pieces, leaving openings for the handle and spout of the teapot. Using a 4 mm crochet hook, work a row of double crochet all around the lower edge; work one stitch into each cast on stitch (88 stitches) plus an extra stitch at each of the seams (90 stitches altogether). End the row of dc with a ss into the first dc. Next round; (miss 2 dc, work 6 treble into the next dc; miss 2 dc, ss into next dc); repeat to the end of the round. Fasten off. Make 2 pieces. Using 8 ply wool and 4 mm needles, cast on 44 stitches, and work in K2, P2 rib for 13 cm. (K2, P1); repeat all along the row. (K1, P2 tog.) repeat to the end of the row. (22 stitches). Next 3 rows, K1, P1, to end of row. Sew the two pieces together to match the outer layers; slip stitch to the outer layer along the cast on edge and around openings for handle and spout. Work the 6 roses and 6 leaves, as described in the 'Crochet tea cosies' page. Using a 3.5 mm crochet hook and 8 ply yarn, make 9 chain. Miss 1 chain, ss into the next 2 sts. Continuing along the chain (which will be the stem and central vein of the leaf when finished); work 1dc, 1htr, 1tr, 1htr, 1dc, 1ss. Work down the other side of the leaf ; 1ss, 1dc, 1htr, 1tr, 1htr, 1dc, 1ss. Fasten off. Make 11 chain. Miss 1 chain, dc all along the row. 1 ch, turn. 1 dc into the first dc; 2 dc into each of the next 9 dc. Turn. Fasten off. Roll up and stitch through the base to secure. Sew a leaf stem onto the base of each flower. 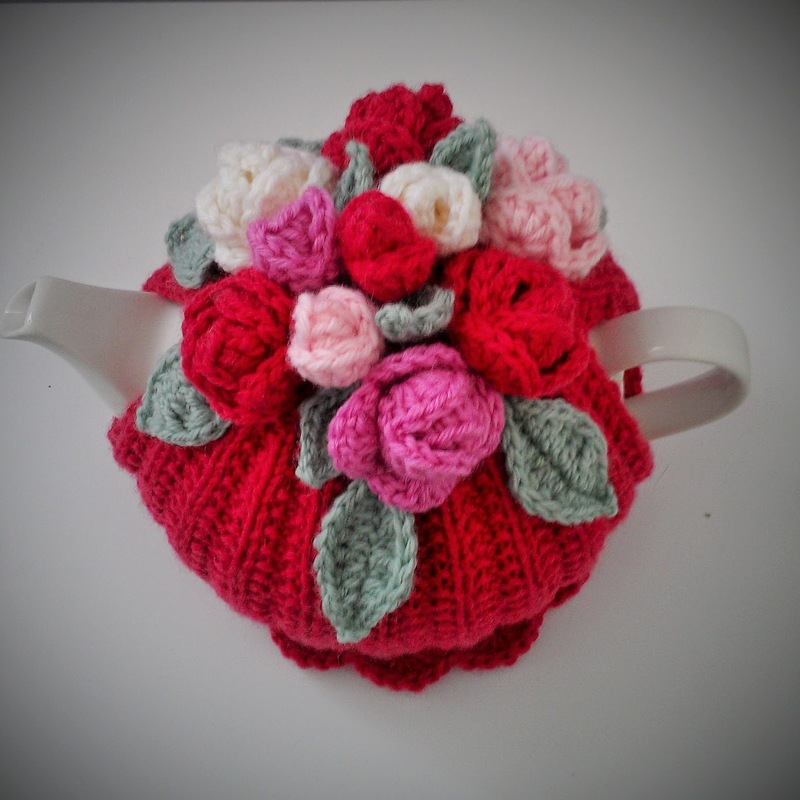 Sew 4 small roses/leaves onto the top of the tea cosy. Sew 6 larger roses/ leaves around these to make the 'bouquet of roses'. I've just mastered making small rose. I haven't been able too access large rose too complete project. Is it possible too send me instructions/copy?